Wilson has created the Hope Ball Hopper Pickup as part of its program to support Breast Cancer Research — it provides an easy way to pick up and store up to 75 tennis balls at once and is an ideal accessory for the teaching pro. The unit is made of heavy-duty plated steel, with handles that fold up for easy ball retrieval. As an alternative, you can flip the handles down and convert them into lock-in-place legs, making it easier to dispense the balls. Best of all, the Ball Hopper breaks down quickly for convenient storage. The hopper also has a no-spill lid, which is extra good news for anybody who has had to play "Pickup 75" and not by choice, if you know what we mean. Wilson has been a corporate sponsor of The Breast Cancer Research Foundation (BCRF) since 1998. All Wilson Hope products feature the BCRF pink ribbon and their packaging includes information on how to prevent breast cancer. A minimum of $500,000 benefits BCRF during the next five years. What better way to show your support for breast cancer research with a hopper of balls! Do you have a tennis friend or family member that has been diagnosed with breast cancer? If the answer is yes, here is a great get-well gift idea for them—pick up one of Gamma's jumbo tennis balls and have everyone on the team, the family or at the club sign it with a personal get well message. Gamma has created a 9.5" diameter inflatable tennis ball with real felt that has the Tennis Against Breast Cancer (TABC) logo on it. This oversize tennis ball ideal for gathering autographs. And, here's the best part. Not only will you be doing something very special for someone in need, every time you purchase a Gamma Pink Autograph Ball, Gamma makes a donation to Tennis Against Breast Cancer (TABC) to fundraise for a cure. 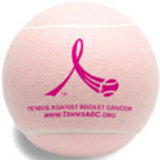 TABC is a tennis organization specially formed to expand awareness of breast cancer and raise funds to find a a cure. Through tennis and sporting events, TABC provides a means of raising funds which have benefited several organizations. Get a ball and support the cause! Available online at Amazon.com.